It's not news that things aren't going well for the Rochester school district. The district's June graduation rate seems to have stalled at about 51 percent, a good bit short of school board members' expectations. District officials are bracing for the State Education Department's announcement of low-performing Rochester schools, a list they expect will expand significantly from last year. And Education Commissioner MaryEllen Elia has dispatched Jaime Aquino, a bilingual specialist in urban education, to somehow drive improvements in Rochester schools. In this context, East High School's record is a strong contrast from much of the rest of the school district. In the three and half years since the University of Rochester took over the management of East, the school has steadily improved. For instance, the percent of students graduating from East in 2014-2015 – the year prior to the UR's oversight – had sunk into the 20s. East's June graduation rate this past school year, however, was just shy of 51 percent. 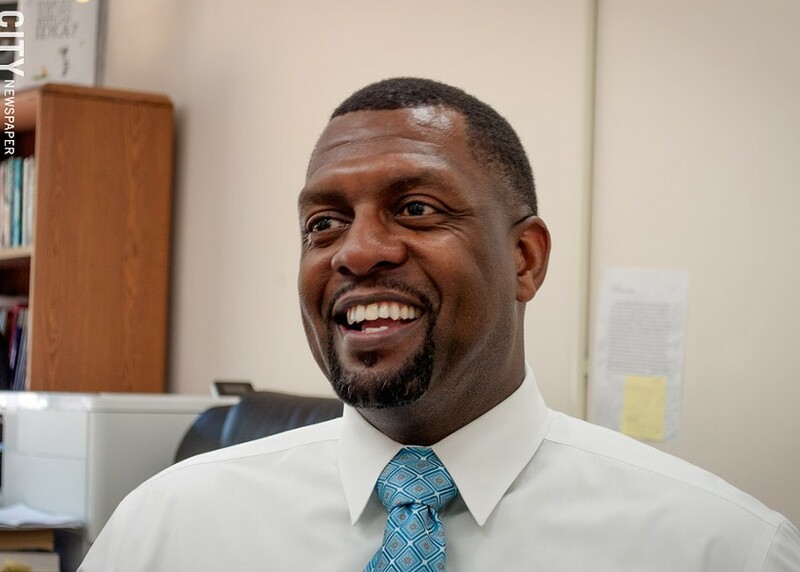 And Shaun Nelms, East's superintendent, expects that the 11.6-point leap the school made from the previous year will be even larger when August's graduation rate is included. East's performance, in fact, helped to prevent the district's total graduation rate from falling this year, Nelms says. "I knew that if you could move the needle in East, you could move the needle for the whole district, and I still believe it," Nelms says. Now well into his third year as superintendent, Nelms says East is on track to reach a 60 percent graduation rate next year. And it's not just East's graduation rate that has improved, Nelms says. The suspension rate at East for the 2014-2015 school year was about 2,500 students, he says. By this past school year, it had dropped dramatically, to roughly 370, he says. The East-UR collaboration is showing solid evidence that it's working as it was intended to, Nelms says. But he's also faced a bucket load of criticism and even some resistance from some district officials. The most recent data is proof that East is on the right pathway, he says, and it's an approach that can be modified and replicated at other city schools. Ironically, there are lessons to be learned about how to improve the city's schools from one of the worst performing schools in the state. East has undergone a major transformation since 2014, when the State Education Department told the school board that the time had run out for East, Rochester's largest public school. The district either had to fix it or close it. Instead of closing East, board President Van White and then-UR president Joel Seligman forged an educational partnership that allowed the UR to essentially take control of the school in the summer of 2015. Under the agreement with the UR, East became an autonomous school within the district supervised by Steve Uebbing, professor at the UR's Warner School of Education. Nelms, who had worked in senior administrative positions in both the Greece and Rochester school districts, was selected as East's superintendent. In many respects, Nelms was the ideal choice. He's the young black male educator that school systems across the country say they're looking for but can't find. In the first year, Uebbing and Nelms reorganized East into two schools: grades 6-8 became Lower East and grades 9-12 became Upper East. Under the agreement with the UR, all of East's staff had to reapply for their jobs, including food servers and custodians. Nelms estimates that 40 percent of the teachers who were hired were from East, 40 percent were from other schools in the district, and 20 percent were either new to the teaching profession, were new to the district, or were from charter schools. That's played an important role in East's improvement, Nelms says. "We did it again this past year," he says. "There are about 200 teachers here, and some were asked to consider their options." Some transferred to a different Rochester school, and some left the district. Everybody has to allow themselves to be uncomfortable when turning around a troubled school, Nelms says. "Not everyone agreed, but we felt it was best for our kids." Some of the problems at East were abundantly clear, Nelms says. And others weren't apparent until he began working there. But a big reason the school had been failing for years is the same reason many of the district's schools show little to no progress, he says. "The first thing I think of is the constant changing of direction from the top," Nelms says. Whether it's changing superintendents, administrators, or building principals, the result is "a very low level of accountability," Nelms says. East's teachers also didn't have a clearly articulated plan for improvement, he says. "When you don't have a plan and you don't have accountability, then things are left to the individuals themselves," he says. "And they go off in different directions." There had been so much turnover and change of direction at East and district-wide that the staff had in some instances become disconnected from the district's purpose or mission, Nelms says. Interestingly, Superintendent Barbara Deane-Williams made similar observations after she joined the district. Deane-Williams said in an earlier interview that the district lacked cohesiveness and systems that worked together, which makes holding individuals accountable a huge challenge. That lack of accountability was reflected in another serious issue for East, a serious lack of attention to attendance. According to the school's enrollment list, East had 1,393 students that first year. But, Nelms says, "we quickly found out that many of these students were non-attenders." Nelms had to do what he calls a data dive into the enrollment numbers in the first year to make sure that the students who were on East's rolls were actually active students. "We found that many of them had not been to school in two or three years," he says. "That's one of our big discoveries. Until we actually stepped foot in the school, we hadn't uncovered what was not in the numbers. It wasn't until then that we truly understood the complexities involved at East." The first year, after a close look at more than 200 students who were enrolled at East and weren't attending, Nelms found that most were over-age and lacked the credits needed to graduate. Many of them were able to return to school or earn their GED online, he says. But in the second year, the state Education Department advised clearing the roster of students who were no longer attending East and didn't respond to repeated efforts to engage them, which the school did. 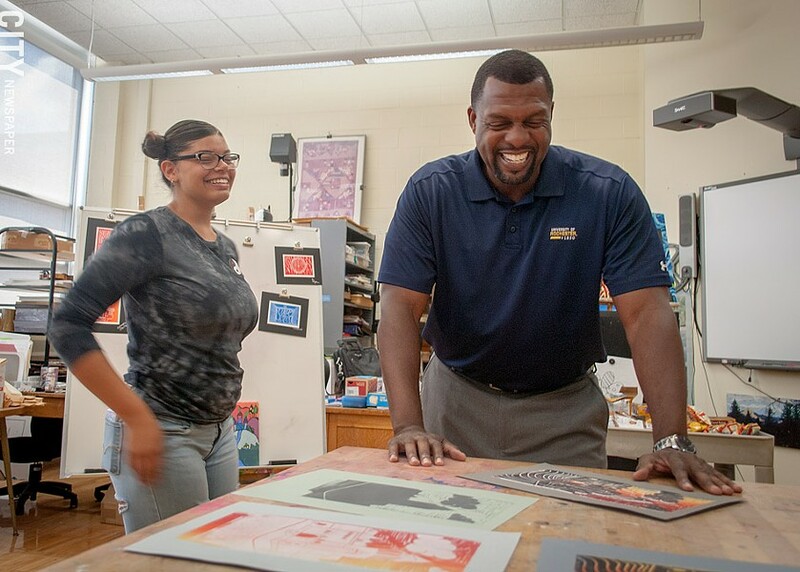 Student Damariz Morale Rios shows her work from East’s summer art camp to Superintendent Nelms. Though East has sometimes been compared to a charter school, that's not what it is, says Nelms. And he says East is not aiming to be what he calls one of the district's "select schools" either, such as School of the Arts and School Without Walls, where students have to apply and be accepted. The goal for East has always been just the opposite: to develop a high-performing high school with students who represent the majority of students in the district. The school's demographics have remained fairly consistent, Nelms says. About 52 percent of the student are black, about 32 percent are Hispanic, and about 10 percent are white, with a small percent who are Asian and Native American, Nelms says. More than half of East's students are English Language Learners, special education, bi-lingual, or all three. "There are 19 different languages spoken here in our ELL program," Nelms says. "I think in our first year, only 2 percent of our kids were proficient on English assessments. So this wasn't a project where the UR got involved with the highest performing high school, nor are we trying to create a pipeline with the highest performing elementary school. 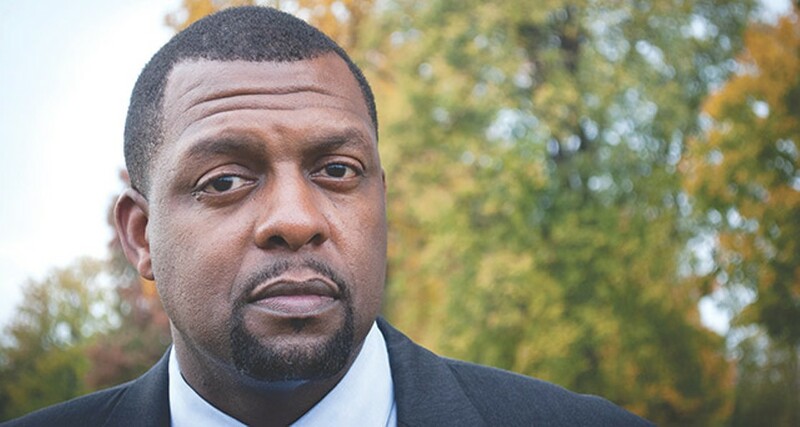 If we're going to make Rochester better and improve urban education nationally, we have to take kids that look like kids in most urban schools." What did need to be changed at East was the approach to teaching, Nelms says. There was virtually no common curriculum, so there was no consistency in what was being taught in grades 6-12, he says. "You had teachers functioning as independent contractors within their own classrooms and departments," Nelms says. Teachers had to completely recalibrate and set their independence aside and work more collaboratively. "We're asking teachers to work an extra hour every day, and we're asking them to give up part of their summer," he says. "Administrators are not chasing kids. They're actually in classrooms and monitoring instruction and giving feedback." More social workers were hired to help provide students with greater access to mental health support, something Nelms says is needed district-wide. And all of East's students are members of a support group, with 10 students and two adults in each group. Every employee at East participates in a group. The groups meet regularly to discuss any problems students might be having either with school work or socially. And students can get individual help as well. "You would be surprised at how many of not just our teachers and administrators, but our staff, our secretaries, and janitors who wrap their arms around our kids," Nelms says. Nelms recalls one student who had just been accepted to college. He was living with his mother and two young siblings when his mother died just weeks before graduation. When the landlord heard about his mother's death, he gave the teenager and his two younger brothers an eviction notice. "This kid was doing everything right in the world in his senior year, and his world crumbles," Nelms says. If no one had been keeping an eye on the student, he might have dropped out of school and not gone to college, Nelms says. But East's administration and staff intervened to support him. Nelms says he doesn't want to give the impression that all of East's students have tragedies. "But the complexities that our kids go through – not all of them, but many of them – need support just to get them back to neutral." The improvements East has made can be replicated at other schools, says East’s Superintendent Shaun Nelms. Even though East appears to be on an upswing, Nelms continues to deal with skepticism and criticism. From the beginning, some school officials didn't support the idea of a partnership with the UR, particularly one that would allow the university to control hiring East's teachers. The partnership with the UR, which has frequently been referred to as an experiment, has put Nelms and the school under a microscope. School board members, state education officials, city officials, and community leaders have all questioned whether the partnership would produce results. 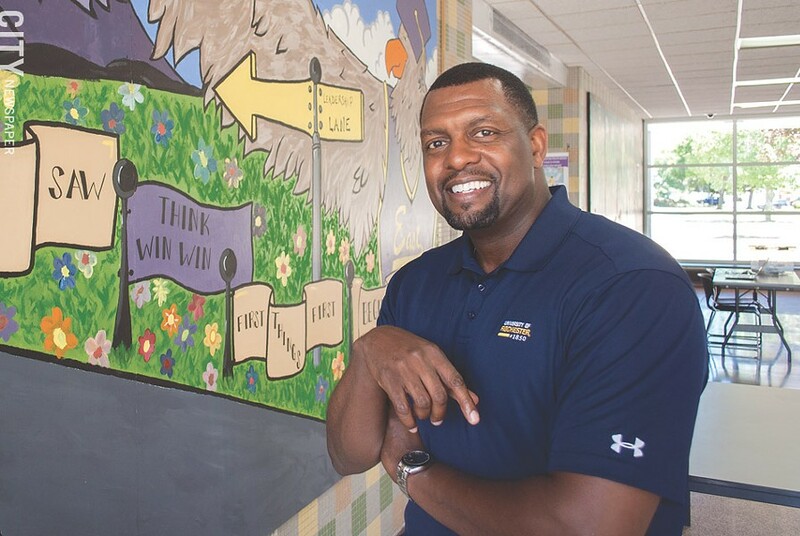 Nelms had overseen more than 20 schools as a central-office administrator in the Rochester district and 17 as deputy superintendent in Greece, but his job at East has been the most demanding, he says. "This is the hardest work I've ever done," he says. "You're talking about accountability being measured every day. Every decision I make, I see it being implemented right in front of me." The criticism Nelms has heard most often about East has to do with the support he's received from the UR. Some of his critics say that if they had the University of Rochester supporting them, their school would be successful, too. And they argue that any school would be successful with the millions in added funding East receives. "I'm glad we're showing a pattern of improvement at East," teacher's union President Adam Urbanski said in a recent interview. "The district managed to prove that you can make an exception to the norm if you invest enough resources and funding." It's not clear, though, that a school like East could have been be turned around simply through extra funding. Most of New York's schools that end up in receivership do get between $2 million and $5 million in extra state funds to help them improve, but that hasn't guaranteed success. And the Rochester school district also gave additional funding to the partnership with East. It was one of the terms of the agreement with the UR, says Board president Van White. Nelms and school district officials disagree about both East's per-pupil cost and the difference between East's yearly operating cost and that of other schools. But all of them agree that East is the district's most expensive school. "The idea was to provide evidence that a large city high school like East can be turned around," school board President Van White says. "They've given us the evidence that will allow us to go to Albany and go to Washington and say, 'If you want these struggling high schools to succeed, here's a way we can do it. Here's proof." There's a cost for years of neglect, says Nelms. The board's decision to provide East with additional financial support took courage, he says, because board members knew that they'd face backlash, especially if the partnership failed. And it meant less money could be distributed to other schools. But one of the alternatives was to close East. And board members have received some of their strongest criticism for closing city schools. In addition, closing schools doesn't reduce expenses; it simply shifts those costs to other schools, according to school officials. Nelms isn't apologetic about the support East receives from the UR through access to medical, psychological, and educational experts at the university. That was always the plan, he says. And though alumni and community members with ties to the institution also help the school, much of that help comes in the forms of volunteering time and providing the school with used sporting equipment, instruments, and art materials. Other schools could capitalize on this asset, too, but they need to be organized to get it, Nelms says. East has more than 100 volunteers, he says. The attacks on East haven't been limited to complaints about the UR partnership and extra resources. Some, Nelms says, have been direct attempts to undermine East's efforts. For instance, in May 2017, the school board voted to make School 33 a feeder school for East. Teachers and officials at nearby School 33 were supposed to encourage fifth-grade parents to enroll their children in East for sixth grade. The Webster Avenue school is one of the district's lower performing elementary schools, and the idea was to get students enrolled in East in sixth grade so some remedial work could begin. In May of this year, Nelms went to the school board's monthly business meeting and complained. The district wasn't insisting that the School 33 staff follow through on that agreement, he said. No one at the board meeting denied that School 33 hadn't implemented the plan or offered an explanation for why it hadn't. But Nelms points to that failure as an example of how responsibility and accountability in the district seem to fall by the wayside. The school board's resolution "clearly states that we would work toward having pre-k though grade 5 at School 33 and 6 though 12 at East," Nelms says. In a recent interview, school board Vice President Willa Powell said that parents were reluctant to move their children out of School 33 after fifth grade and into East. And, she said, Nelms needed to do a better job of selling the idea to parents. In addition, the feeder plan for East is really a back-door approach to a neighborhood school, said Powell, who is one of the biggest advocates of the district's school choice policy. The plan might also mean that School 33 would have fewer students. But Nelms doesn't buy that argument, and he goes back to the issue of chronic instability that permeates the district. "If your kids are in a suburban school, you have a clear sense of where they'll go to high school," he says. That's important, he says, because then there's better communication about students among the staffs at lower schools and upper schools. The feeder-school agreement is now being implemented, Nelms says. And, he says, the arrangement could have a positive effect on the neighborhood. Families will have a good reason to move there and stay there if they know their children will go to a better city high school. "The vast majority of 33's kids are not at or above grade level," Nelms says. If East can get to those kids earlier, "we would have a stronger group of kids coming through East." Though less than two years remain in the five-year agreement between the Rochester school board and the UR, Nelms says he hopes the partnership with East will continue. Nelms, board President White, and East's supporters at the UR believe that the success at East can be replicated for other city schools. "I just don't think the problems in Rochester's schools are so complex," Nelms says. "Maybe we could all step back and strip down what has happened during the last 10 years." Then, he says, the school staffs can focus on their "core beliefs and build on them." When a parent walks into a school, Nelms says, teachers and administrators at East or any city school should be able to tell them from pre-k to 12th grade, here's the plan: "We guarantee you that your child will receive this fundamental education. This is your child's right."